Peonies are flowering plant in the genus Paeonia, with over 30 species and over 3,000 cultivated varieties. Herbaceous peonies (P. lactiflora) and hybrids of these are the most commonly used peonies for cut flowers. Their bloom shapes are typically assigned to one of four groups: single, semi-double, Japanese, and double, with double being the most popular. Double blooms feature many layers of ruffled petals, and usually no visible stamens. 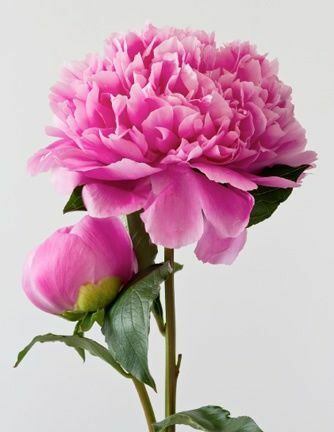 COLOR RANGE: One of the most commonly recognized peony color is pink, though their palette includes white, rose, coral, red, dark purple, and even yellow. AVAILABILITY: Generally only available inspring and early summer. CARE AND HANDLING: Peonies will often arrive with their blooms in a tight ball (though they won't stay that way for long). Remove any bruised or discolored petals on the outside of the ball, and be sure to remove leaves that will sit below the water line. Cut the stems at an angle and place in a large vase (to allow sufficient room for the blooms to fully open) with plenty of fresh, clean, room-temperature water. Refill as needed.